Write Terribly and Feel Great — Ginger writes. 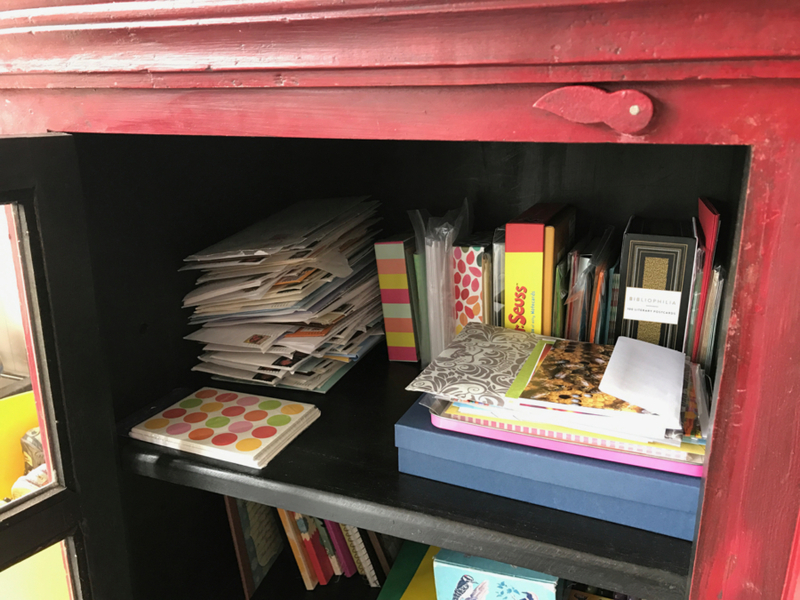 About a month ago, I wrote a post on the connection that letter-writing has fostered between myself and others. I didn't mention it then, but most of that blog post was excerpted from one of the three sample chapters I wrote this past summer for the book proposal I was working on. I don't know if my book will ever get finished or published. Even if it does, there is no need to save what I wrote for "some day." If it's good writing, it will be just as relevant in the future, as now. Or vice versa. And if it's bad writing, no matter. "Things rise and fall for no reason. And what a great opportunity that is! You can start writing again at any minute. Let go of all your failures and sit down and write something great. Or write something terrible and feel great about it." Just because I wrote chapters for my theoretical book doesn't mean they're worth reading, but they were absolutely worth the writing. A babysitter got practically rich last spring and summer while I dug deep in the soil of my heart looking for treasure. I found a little bit more each time I struggled in the dirt, kneeling and kissing the ground, as wise Mr. Rumi taught us to do. Wanna hold my treasure for two or three minutes? That's how long it will take you to read the excerpt below from the (not yet a) book. Stop first and make a cup of tea if you wish. Or go grab a pen and notecard so you can respond in kind. You know people who will love your words, people with whom you desire connection and friendship, people for whom you can offer a treasure of your own. Write beautifully or terribly. And feel great about it! Disclaimer: If what you are about to read creates a sense of déjà vu, then congratulations! Two things must be true: You have been reading my blog for a while, and your memory is better than mine. After composing today's post and making a number of revisions to the excerpt below, it suddenly dawned on me that I had already borrowed this bit from my book proposal a few months back (mid-July blog post if you are curious enough to go looking). I made changes, of course, as is likely to happen when reading a four-month old essay, so the piece is not exactly the same. Neither are you. Neither am I. We come at our writing and reading from such different places at different times. So carry on now: may you read again for the first time. Three-fourths of my life ago, I was a camper at Ambassador Camp, a small Christ-centered camp in rural North Carolina, about an hour from where I grew up. It was at camp that I began my collection of childhood penpals, said yes to Jesus with as much understanding and sincerity as an elementary-age child can muster, and learned silly camp songs that I’ve never forgotten. Ah say pah say boomday boomday boomday-oh. Wikipedia calls Sarasponda "a children's nonsense song which has been considered a popular campfire song. It is often described to be a spinning song, that is, a song that would be sung while spinning at the spinning wheel. It is frequently described as being of Dutch origin..." How interesting. To me, it was a bunch of made-up words that were fun to learn and sing at camp and then to sing again and again at home after camp. And now let's talk about correspondence. What a similar sounding word, I always think. I love the word correspondence. I like to say it in a whisper and out loud, and I like to write it in letters. I like that it holds respond right in the middle, in the heart. In the dictionary, correspondence means "communication by exchanging letters with someone.” But it also means "a close similarity, connection, or equivalence," as in There is a simple correspondence between how much sleep I get and how much energy I have. The two are connected. Yes, the two are connected. I write a letter to you, and now the two of us are connected. We may begin a back and forth exchange of words, a responding to one another. Correspondence can happen over email or by text, or if held to a loose standard, correspondence can even happen on Facebook, Twitter, or Instagram. But these electronic communications don't hold the same weight. When a letter is the chosen means of response, there is a deeper depth to the words and a prevailing physicality that enhances the correspondence experience. I have found this to be true again and again. Instead, I decided to write Mindy a real letter. I thought a letter would be more meaningful and fun for her to receive, since there’s nothing novel about a text anymore, even a text from a friend you haven’t seen or talked to in a while. But a letter is rare, like finding a parking spot at Tandem on a Saturday, and it makes you pay attention. Your mind does a little backflip as you think Whoa! A Parking spot! Someone wrote me! I wasn’t expecting that. A letter is weighty, too, even if its subject is light. I wanted Mindy to have a card in her hand, the very same card I had in my hand just a few days prior. I wanted her to read my handwriting and hear my voice in her head, because that is what I have to offer. A letter is real and it forces engagement on both ends, while a text is like a puff of smoke. A text is often forgotten as soon as the screen goes black and the phone goes back in the pocket or the purse. I scroll through words that friends write on Facebook, and like a vapor, the words vanish from my mind in an instant. I’ll close my laptop with a nagging feeling that there was something important I just read, some piece of news worth remembering and congratulating. It eludes me, and frustrates me. Why can’t my brain keep alive and well what I just read ten minutes ago? But a letter is different somehow. A letter is a vessel. It’s someone’s heart in my hands. A letter gets touched, taken, read, placed, perhaps misplaced, found, reread later, saved, and remembered. The writing of a card to Mindy would cost me more than sending that quick text before bed. But it is a price I wanted to pay. This simple act of correspondence is what was binding me, over time and space, to Mindy. "When we take the time and when we have a really private and unique communication with one person we're really having a true relationship with them. We're engaging with them in a way that is really special….When you're in a relationship with someone, you can't always be in their face. You have to give them space and time and that's exactly what letters allow us to do." Even when my letters were not reciprocated, and in those waiting places where there was no respond to be found in correspondence, I was still glimpsing beauty in the dirt that I was kneeling down to kiss. The beauty is this: Writing a letter is taking what’s inside your soul and letting it flow out through the ink of a pen onto paper. It’s wrapping your soul up just so, letter-size, and placing it an envelope. It’s sealing up what’s inside and then putting on a stamp that says Forever, knowing the words are Forever Yours and now Forever Someone Else’s. You send your soul via the USPS, and the mailman has no idea. Every letter should be marked “Fragile,” don’t you think? And now that you’ve let your soul go, you rejoice knowing there’s a mingling of souls, a connecting of dots, about to take place in the universe.